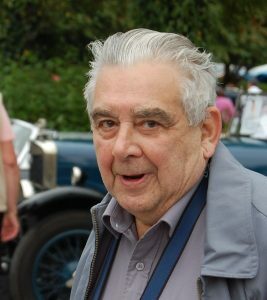 A very well-known born and bred Bollingtonian, Eric Wainwright was for more than 50 years a recorder of life and events in Bollington using his slide camera and cine camera. Eric’s father died when Eric was just seven months old, and he was brought up by his mother. He spent all his working life as a printer at Jones Printers & Stationers, which was located on the corner of High Street and Store Street (where the café is today). He never married – he was a very shy and private man. But that didn’t stop him knowing a lot of Bollington people and he was well loved by the community. He went on countless holidays with friends and family, at home and abroad, seaside and country. Eric’s legacy to the town is his enormous collection of photographic slides and films. He seems to have first acquired a camera in the 1950s. Though he took a lot of still pictures, his clear preference was film. As the technology improved, so Eric bought ever better film cameras, finishing with a digital movie camera. He took his camera everywhere – he was never seen out and about without it. Everyone and everything became his subjects. Many of his films are silent. In 2011, as his health was declining, he asked me to pay him a visit at his home in Harrop Road. It was an Aladdin’s cave of technology, not just film making, but video player, CD and record player, and all kinds of wiring between them! There were also countless boxes of Kodachrome colour film, some of it decades old. Then he took me to his store cupboard – it, too, was stacked with reels of film and boxes of slides, amongst much else. There were, for example, several ancient film projectors, all quite obsolete. But nothing was ever thrown out of this house! His reason for calling me was not just to show me his life’s work, but to tell me that it was to be his gift to the community, for the people of Bollington to enjoy. He wanted the films to be preserved by the North West Film Archive in Manchester, on condition that a copy was returned to the safe keeping of the Civic Society for the enjoyment of the whole community. In July 2011 Eric went into care at The Mount where he spent the last two and a half years of his life. After suffering a stroke, he died in Macclesfield hospital on 26th December 2013, aged 85. On moving out of his house, it fell to his relatives to empty it, and I was invited to identify and rescue all the films and pictures and relevant equipment, and remove it to store. The 133 films recovered from the house duly went to the archive in Manchester where they were checked over and those that had not deteriorated beyond saving were copied into digital files. One of the problems with old film stock is that it can become brittle and prone to disintegrate and catching fire when put through a projector! Those could not be viewed at all. Old film also tends to change colour and gather faded and coloured blotches, so some of the oldest films were, sadly, beyond recovery. However, a large number were saved and recorded on disk. The sound-tracks of some could not be recovered. The next task is to view and edit them to make up videos of reasonable to good quality pictures fit for public viewing.